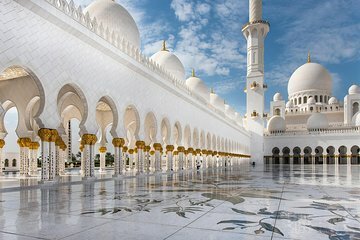 Take in Abu Dhabi’s sights on a day trip from Dubai, led by a professional guide and usually conducted in several small groups. After journeying through desert landscapes and past Jebel Ali port, check out the must-sees of the UAE’s gleaming capital. Visit the beautiful Sheikh Zayed Grand Mosque and Abu Dhabi Marina Mall, and view the palm-fringed Corniche, Yas Marina and more. Explore Abu Dhabi’s Bedouin roots at the Heritage Village, an imaginative recreation of bygone desert life. A great way to see Abu Dhabi. Definitely something you have to do. I have booked many tours by Viator in previous years but this was the worst tour ever! No previous information of the departure time, I had to call the agency twice once from home and the other time a day before and they have promised to send me sms msg, nothing happened and we have spent an hour waiting in the hotel lobby because they had no 'contact number' before opening the agency at 9am when they finally told me that the guide will come between 9:30 and 9:45! The 'professional guide' who came had no communication skills at all, did not even introduce himself or said a few introduction words and was silent for the first 45 minutes! He was only answering our questions in not very good English but was not 'in a mood' to talk more then absolutely needed. He was only a driver dropping us off and waiting us to see various attractions by ourselves. The day before we also did a Camel ride tour by Viator but with another local agency! and everything was more then perfect! Four of us were absolutely disappointed with this Abu Dhabi tour but luckily, we liked the beautiful Mosque and Emirates palace hotel and had fun anyway. Loved the tour though was really hot in the mosque especially with the extra clothes on. Would recommend this trip. Renaldo was amazing. The tour company is fairly new which was perfect for myself and my family, because we weren't on a large tour bus and got to pick and choose which activities were most important to us. We went to the mosque and Renaldo had extra outfits for those who were not dressed properly. He also made sure we were informed on the histories of both Abu Dhabi and Dubai, sharing both fun and informative facts. I would definitely encourage everyone to take this trip if you are looking for a fun, informative, and leisurely day in Abu Dhabi. day trip to Abu Dhabi and our driver/guide Ronaldo was exceptional.